Drunk Elephant is a skin care brand whose all natural products are designed to give you your best and most healthy skin. They offer products intended to cleanse, correct, exfoliate, moisturize, and protect your skin. With Big Apple Buddy’s personal shopping service, you can now buy direct from the USA Drunk Elephant online store anytime, anywhere. The T.L.C. Framboos Glycolic Night Serum is a refreshing, hydrating gel that replenishes dull and congested skin by gently lifting dead skin cells away while you sleep. Incorporate this serum into your nightly skincare routine, and you’ll soon start to see a more even-toned and radiant complexion! This serum works to fight fine lines, wrinkles, excess oiliness, acne, and the appearance of pores. All you have to do is apply this at night before you sleep, and let the serum do the work! But your skincare routine shouldn’t be saved only for the night time, and that’s why Drunk Elephant also offers the C-Firma Day Serum. This super potent Vitamin C serum is packed with a powerful antioxidant complex, tons of essential nutrients, fruit enzymes, and more. All of these work together to firm and brighten the skin, while also correcting and preventing photoaging. This serum will even out your skin tone and dissolve away unwanted surface skin cells. 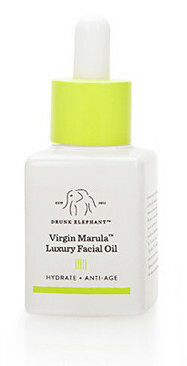 Facial oils can also be extremely beneficial and healing for the skin, and if you’ve been wanting to test it out, then the Virgin Marula Luxury Facial Oil is the perfect place to start! This facial oil is virtually untouched by any chemical or fragrance, so you can be sure that you’re putting the purest of products on your face. This facial oil delivers protection against environmental stressors and will noticeably reduce the appearance of fine lines, wrinkles, redness, and blotchiness, with an improvement in skin elasticity also. Unfortunately, the USA Drunk Elephant online store does not currently offer international shipping. However, Big Apple Buddy, your personal shopper, can help you buy products direct from the official USA Drunk Elephant online store and ship them to your doorstep, no matter where you are in the world. If you would like to buy from the USA Drunk Elephant online store, simply let us know which items you would like to order (by filling out the form below) and we’ll get back to you with a free international shipping quote within 24 hours!